I arrived in Chesterfield a town close to St. Louis in the state of Missouri about a month ago. So far it has been an amazing time of my life. The first few weeks went fast by meeting new people, getting used to living in a new home and going to soccer practice. Everything was new in the beginning and at times I was tired of everything being new and felt that I didn’t have that much energy some days. But getting used to all the new things was also a lot of fun and exciting. I still remember walking into my new home the first time. Going through the house and seeing my own room and thinking how I would live here for a year still seemed like a dream in my head. Getting to know the few rules in the house and just trying to figure out where the plates and forks are for the first time was its own little challenge. I was honestly in the first couple of days scared to eat food without someones permission to eat it but that’s obviously changed now. It’s easier now because I know how everything works in the house. I’ve got to know my family so well so fast and even the dog (King) that hated me at first is now ok with me. Especially in the first couple of weeks I spent a lot of time getting to know my family and explaining to them what kind of person I am. The first time speaking in English felt weird and already in the first month I feel like my English has become so much more fluent and most of the time I think in English and even sometimes dream in English. There are still times when I totally forget what something is in English and I have to quickly use google translator on my phone. What’s weird for me is that when for the first time I said vending machine nobody understood me because apparently I say the letter v in a weird way. Another one is the letter g which is impossible for me to say so that the American people understand it because for example when I said that I’m going to the gym, my dad thought that I said Jim at first and he was so confused because I don’t have any friends called Jim. My friends are having a good laugh every time I say vending machine, but I’ve started teaching them Finnish and when they try saying something in Finnish it sounds terrible and then I’m having a good laugh. I will be happy if they know even one word in Finnish after this year because of our language being so hard to pronounce. I think the first month for all the exchange students is very exciting because of all the new people they meet and getting used to a new culture. Now is the time where I’ve got used to my life and it’s different compared to the first few weeks. At the beginning everyone was excited to meet me, one reason being that some people haven’t even heard of Finland and if they have they don’t know almost anything about it. At first I was so excited to tell people about Finland but as time went on and I kept meeting new people I started getting bored and didn’t want to give them a lecture about Finland so if I want quickly explain what kind of country Finland is I usually just say that it’s cold and people are shy. Obviously that’s not the whole truth and I could give them an hour lecture about Finland but usually most people don’t care and I’m too tired to tell them. But I have told my family and my good friends here a lot about Finland and I’m still teaching them new things about Finland. We have done a lot since I arrived here and now that school has started it’s very busy but here are a couple of things we have done: We had a food court meeting with all the St. Louis students and their families, we’ve already had four games this season and before the season started we had a day called red and white night where the school represents the teams for all the sports, we went to downtown with my friends, I have gone to like 10 new fast food restaurants, we saw the total eclipse in our school and we went to a Japanese festival near downtown. I have already experienced and learned so much in these first four weeks and I couldn’t be more excited for the rest of the year. A few years back I couldn’t even imagine going on an exchange year and now that I’m here I can’t think of not coming here and I’m so happy. I always thought that I would be the last person to go on an exchange year and I think many of my friends thought that too because before you get to know me I tend to be a little shy and not the most outgoing person. People here in the US and in Finland often ask me “Why do/did you want to go on an exchange year?”, and for a long time I didn’t have a clear answer to that and I just used to say that I like the US and former exchange students said that it was an amazing experience. But a week before I came here it really hit me that now I’m going away for a year to live in a new family and country and I really started to question my reasons and I realized that life is about memories because in the end of the day you are only going to remember the best and most important memories and that’s what life is about, making those memories and making yourself happy and I realized that those are the two biggest things about an exchange year and former exchange students always say that it was the best time of their lives and they will remember it for the rest of their lives. So with many different reasons for my decision to go to an exchange year my two biggest reasons are the memories and making myself happy. I arrived in the US earlier than most exchange students and I was able to go into the high school team soccer try outs. I was lucky to get a ride to the first practice from one guy who was a friend of my familys last year exchange student. He is now probably my best friend here and takes me to school every day so I was very lucky to meet a very good friend so early. 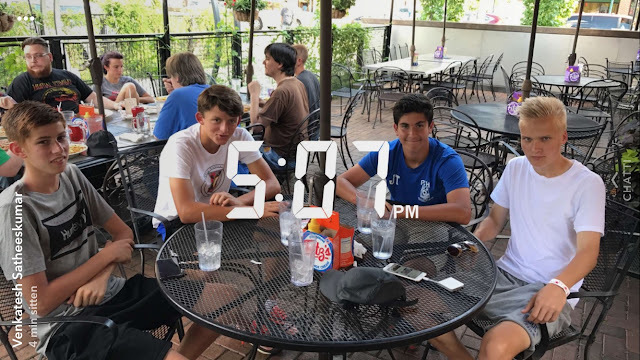 The soccer guys were very friendly to me because they had exchange students in their team before and I really like the soccer team because I have good friendships with the players which makes the practice a lot more fun. I think my team in Finland is a lot better but that’s because we have players from all over the city and only the best but here they can only make the team out of the people in the school. At the end of the day sports is the best way to make new friends and that was very true in my case. I’m playing the right and left wing on the team right now and our goal is to win the state championship. The school here is just like I imagined a high school in the US would be. There are many things I don’t like about the school: Bringing your own lunch, school starting very early (7:35), a lot more homework compared to Finnish schools, short times between classes and teachers being very strict about coming late to school and using your phone during the class. Then there are things I like about the school: Seeing your friends and meeting new people, teachers being helpful to exchange students. I like my competitive sports class and a class where we talk about issues worldwide. There is a football game every Friday and a lot of people come to the home games. It’s a good opportunity to meet new people and to hang out with your friends. I also go to the away games with my friends and we have our own chants and all the away fans dress up into something. My family here is amazing and I couldn’t be happier. In my family I have two sisters (Sabrina 12 and Nami 17) and two brothers (Daniel 13 and Alex 14) and I get along with all of them so well. My parents are amazing: Kumiko my mother and especially Stephen my father who helps me with so many things. And we also have a dog called King. I just want to say that I couldn’t have gotten a better family and I am so grateful for that.